Season after season, on the track, on the roads – at one national championship after another – Aaron Braun has been in the mix, establishing himself as one of the top distance runners in the country. 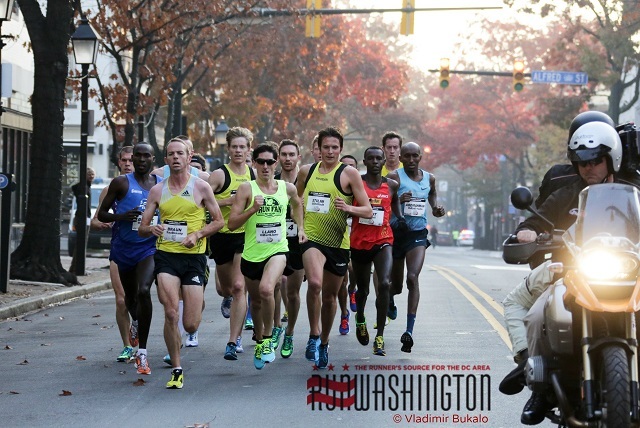 The inaugural championship race capped the 2013 USA Running Circuit (USARC), a road racing series that includes national championships for races ranging from the mile to the marathon. The first 10 U.S. runners in these races earn points, with 15 awarded for a win. The .US National Road Racing Championships, however, offered triple points, not to mention $100,000 in prize money. And it was contested at the uncommon distance of 12k, an unfamiliar distance serving as something of a middle ground for 5k specialists and marathoners. What made today’s race interesting, though, was not so much the unique race distance; it was the time of year the race was held. Some of the pros entered in today’s race had run marathons the month prior. Some had been racing relentlessly since January (and coming off a marathon), thus operating on fumes. Others, like Braun, came in focused and fresh. The lead pack was at least a dozen strong through 5k. But Braun – from the very beginning on Union Street – seemed to be the one tugging the strings, injecting fresh pace at mile marks or surging off some of the course’s tight and even 180-degree turns. The opening pace through the first few mostly-flat miles was about 4:40. Spectators lined the intersections to cheer, and Abdi Abdirahman and Shadrack Biwott at times moved out into the lead. Pre-race favorites Matt Tegenkamp, leading the USARC standings, and Chris Solinsky tucked into the group. Solinsky, who dropped out, started to fall off first, shortly around 5k. Tegenkamp started slipping back closer to a turnaround near five miles. Tegenkamp fought through a tough day to finish eighth. Braun’s time, 34:28, was two seconds shy of Steve Spence’s American record. Maybe if Braun had not looked back in the closing stretch and waved to the crowd and enjoyed the moment … maybe then the record could have been his. Braun recently returned to a former coach and his native Colorado, where he also attended running powerhouse Adams State College. He made the change, he said, out of concern that his performances had leveled off. Sensing Braun was on his game, Shadrock Biwott – second in the standings – focused on not letting him get too far away. His near-breaking point came while heading up the bridge between miles five and six. There was a tight turn to make at its end – and Biwott, entering his rough patch, said his focus was further thrown by seeing Abdirahman take a hard fall there that ended his race. But Biwott successfully re-grouped to hold on for second, seven seconds behind Braun – a result that earned him the USARC series title. Next in the 12k was Tyler Pennel, 25, of Blowing Rock, N.C., finishing third in 34:37. It was Pennel’s first race since Peachtree in July, and his first race in a new season he hopes will peak in January at the national half marathon championships. Chris Kwiatkowski of Washington, D.C., recently finished fourth at the Army Ten-Miler in a new personal best of 48:17. He is coached by Matt Centrowitz and runs for the Pacers-New Balance team. Kwiatkowski ran confidently this morning in the thick of the lead pack. He started to lose contact around five miles but held on to finish 12th. Matt Llano trains in Flagstaff, Ariz., but attended Broadneck High School in Annapolis and competed for the University of Richmond. He finished seventh today in 34:49, matching his place at the national 20K championship in September and continuing his recovery from an injury that sidelined him for most of 2012. His parents, sister, college teammates and even his former college coach were there to see him race. Llano hoped to crack the top five, but “I’m just confident that my fitness is still coming along,” he said. Thomas Jefferson High School graduate Christopher Landry, who now trains in Ann Arbor, Mich., finished fourth to cap a USARC season that also included top five finishes in the national championships for the marathon and 25k. The College of William and Mary graduate wasn’t sure how he would fare at 12k six weeks after a marathon. But today’s race – “a homecoming,” he said, with his family there supporting him – wasn’t one he wanted to miss. “This exceeded all my expectations,” he said. RunWashington’s story on women’s race.